Lee Wulff triangle taper lines for Spey casting. Triangle taper lines for salmon and steelhead. Spey lines for salmon and steelhead fly fishing. I have separated the triangle taper line design out from the other weight forward Spey lines for special mention because its floating version has caught me so many fish over the years. Lee Wulff's design was the first modern line with a long taper similar to Alexander Grant’s continuous taper lines and it is marketed as the Lee Wulff Triangle Taper. This line has been around for a long time now and fortunately it is still available. 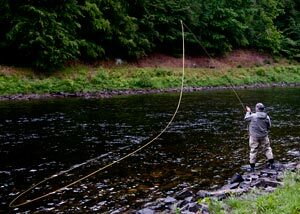 It is lovely line for floating line fishing and Spey casting, the long fine taper allows the most delicate presentation possible at any distance, a great advantage in low water conditions. Rod loading for the shortest of casts is reduced by the lack of line weight due to the long fine taper but once the majority of the head is in use the line becomes a pleasure to use. The long taper is not ideal for attachment of heavy sinking leaders that would contravene the principle of continuious mass taper. For the use of heavy tips a line with a steeper front taper or a purpose made multi-tip line is preferable. Due to their more delicate tip profile triangle taper lines of 70 and 80ft head length are more easily cast than a normally proportioned WF Spey line of that length. Multi-tip Lee Wulff triangle taper lines are also available and the taper design has been specifically designed to cope with the additional loading imposed by the tips and ensure good turnover.